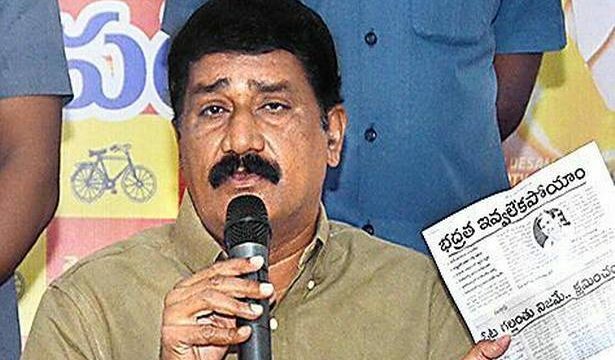 Brushing aside the claims by the YSR Congress Party leaders that the Telugu Desam Party would face a defeat in the general elections, HRD Minister Ganta Srinivasa Rao on Monday asserted that his party would register victory in at least 125 Assembly constituencies of the total 175 in the State. Alleging that the Election Commission had failed to ensure ‘free and fair elections’, the TDP leader claimed that 30 % of the EVMs had malfunctioned during the polling hours. Rubbishing the claim of the Election Commission that only 144 EVMs had malfunctioned, he said despite hardship, the voters had returned the polling stations to exercise their franchise. “The people of the State are with the TDP,” he told the media here. Mr. Srinivasa Rao further said that even as Chief Minister N. Chandrababu Naidu took up the issue pertaining to EVMs with the Election Commission India in New Delhi, the YSRCP was interpreting it in different ways. “The YSRCP leaders are making hollow claims and it will be proved once the ballots are counted on May 23. The TDP will wrest all the 15 Assembly seats in Visakhapatnam district,” he claimed.